Mirshalak's Lair: I was wrong, and I'm sorry. I've actually gone back and done some more testing with the 0/10/51 spec. The reason why is because I noticed that my RAP, with 0/10/51, was as high as it had been with 0/43/17, pre-3.0. This made me think that an Explosive Shot/LL build genuinely was viable; I simply had to work out how to incorporate ES tactically. I also, of course, was upset about the idea of having to leave Survival more or less permanently, which, at least in PvP terms, I had thought that I would have to do, if WoTLK didn't improve things. My findings made me realise that more or less everything I said about Explosive Shot and Lock and Load in my last post was incorrect. I will admit that most of what I wrote in that post was primarily based on listening to crying in the forum, (which I should of course never do) and not on real testing of my own, so much. These two talents actually fit in with my customary practice of dotting and kiting (in battleground PvP) exceptionally well, and allow me to kill a target far more rapidly than I had been able to in the past. For doing dailies on the island, I found the 0/10/51 spec to be very good as well. As I had anticipated, threat can be a minor problem, especially considering that I don't have Go For The Throat, but I find that if I get a Lock and Load proc from trapping every time, mobs usually die before they get to me. I will say that, while I still always put points in Savage Strikes, I am not melee at all any more, other than for kiting. It's been probably at least a year since I've put points in Deflection or Counterattack, also. Although I used to use those things, I find that these days the other people I'm fighting simply have too much armor for extended melee to be viable. My opinion on Survival's ability for levelling has changed, as well. Although I still see Hawk Eye and Savage Strikes as being very important, any future alts I make will get 5/5 Improved Tracking from level 15, as well. Hunter Vs. Wild can also be obtained at level 25. I am also going to get Hunter Vs. Wild and Noxious Stings pretty much every time I use a deep Survival spec now, as well. This is the result of probably my best AB match yesterday, with the 0/10/51 spec. You can see the Explosive Shot icon in the screenshot. This indicates what I'm finding, that while it is possible to still make the top (or close to the top) of the damage or killing blow chart in AB, unlike with Marks, with this build I have to work very hard to get it. I don't mind that so much though, because truthfully I was actually getting a little bored with Marksmanship before the patch, because with it I could get top 3 in my sleep. I like it that Survival is more difficult, because it means I have to become a better Hunter. I don't have the problems with Ret Paladins that other people seem to, either. It's true that if they start first, they will kill me in two or three hits, but I was still able to narrowly kill a couple of them one on one, and I actually noticed that they were more likely to wait for backup than to try and kill me on their own. That implied to me that some of them still weren't feeling very confident, despite having the new level of ability. 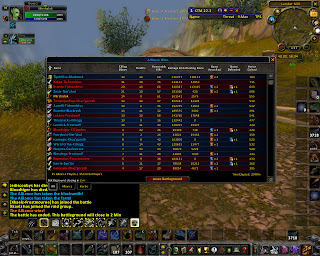 Dismantle with Rogues isn't as bad as I thought it was going to be, either. Again, I've been killed by it a couple of times, but I'm noticing that it seems to make them complacent as well; they seem to rely on it as an "I win," button and haven't been using their other abilities against me as much, like Shadowstep or Blind. I'm also able to wait until Dismantle times out sometimes as well, if I trinket, trap them, and then run away.